The Data Connect Copper-T and Copper-E are 4-wire repeaters for use on customer owned lines or extend Telephone Company demark. The Extenders are used to extend in-house T-1 and E-1 in campus and high rise environments. Each pair of T-1/E-1 Extenders may be located up to 5000 feet apart. The Extenders circuitry is rate to -36 dB dynamic range at the T-1rate of 1.544 Mbps and -43 dB dynamics range at the E-1 rate of 2.048 Mbps. As implemented, the parts are slightly de-rated to provide long life at extended temperatures range. Therefore the distances specified in this document are only 5000 feet. Solid copper 22 AWG, two twisted pair is the preferred cable for connection between the Extenders. Connection to the Extender is made through Rj-45 modular connectors or 4-wire screw down barrier strips. Each Extender comes with two screws down barrier strips and one RJ-45 connector. If only RJ-45 connections are desired extra RJ-45 adaptors (part number 9502122) can be ordered. The Data Connect Copper-T and Copper-E are powered by a small wall-mount transformer. 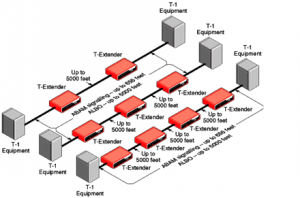 The Extenders are designed for connection between T-1 equipment such as PBXs, T-1/E-1 line drivers, CSUs, router or any other T-1/E-1 equipment requiring long customer owned cable runs. T-Extenders and E-Extenders can be used to connect this equipment across a campus, between floors of a high-rise office building or between office buildings with underground cables runs. The T-Extender/ E-Extenders are transparent to type of data sent over the T-1/E-1 link. The Data can be D-4 format, ESF, PRI, G.703, G.704, etc. The T-Extender is most often used in pair to extend a telephone company demark. For example, if a CSU or DSU is limited to 655 feet and is connecting to a phone company smart jack demark which is limited to 655 feet, the T-Extender are used in pairs to extend that distance up to 5000 feet.